If first impressions are anything to go by, 30-year-old Liz Crow is off to an auspicious start in the Thoroughbred industry. Authorized to purchase yearlings on her own for the first time in 2016, Crow went searching for bargain buys at the Keeneland September sale with a maximum budget of $100,000. As it turns out, 100 would be her lucky number. 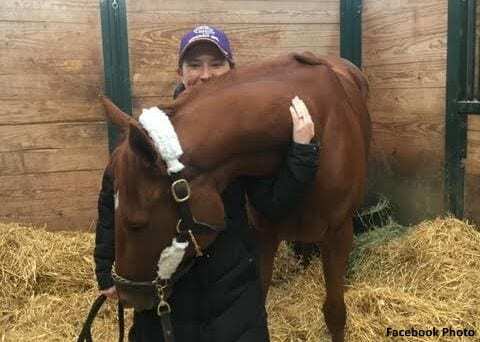 An unfashionably-bred chestnut filly was the first horse Crow signed for, and she found herself rushing to the bookkeeper's offices to explain she was buying on behalf of owner Sol Kumin. It proved to be $100,000 very well spent, as the Tapizar filly has proven herself beyond a shadow of a doubt in 2018. Monomoy Girl's career earnings are currently just shy of $3 million, and the tenacious filly is expected to race on into her 4-year-old season for trainer Brad Cox. The filly's quintet of Grade 1 wins this season includes the Kentucky Oaks and Breeders' Cup Distaff. Monomoy Girl crossed the wire first in each of her seven starts in 2018; she was disqualified for interference in the G1 Cotillion at Parx. In addition to the likely Eclipse Award winner, Crow found another $100,000 gem in 2016 in the form of maiden Leofric. In 11 starts for new owner Steve Landers, the son of Candy Ride has never finished worse than third, and his biggest triumph came in last Saturday's Grade 1 Clark Handicap at Churchill Downs. Another early success in Crow's career is the $100,000 Long On Value, purchased at the 2017 Keeneland November sale. The 7-year-old made just two starts this year, winning both, including his first Grade 1 in Woodbine's Highlander Stakes. All three “lucky 100” horses are conditioned by Brad Cox, with whom Crow has developed a strong partnership over the past several years. They were initially introduced by Ten Strike Racing, Crow said, back when Cox had just gone through the overwhelming loss of most of his stable owned by Midwest Thoroughbreds. More public sales triumphs came in the form of a $60,000 yearling pinhooked for $1 million at OBS in 2017, and a $150,000 purchase from this year's OBS April sale, Stellar Agent, recently finished third in the Breeders' Cup Juvenile Fillies Turf. Crow came to the Thoroughbred industry as an outsider, having grown up with hunter/jumper horses in Maryland and occasionally attending races as a fan with her grandparents. Her first job was in the racing office with Georgeanne Hale in Maryland, and Crow later worked in the claims office at Churchill Downs while attending the University of Louisville's Equine Industry Program. After graduation, Crow spent time learning the racing side of the business with trainers Eoin Harty and Jonathan Sheppard. In 2011, she took a job with Pete Bradley in Lexington to manage, develop and expand on racing partnerships. While there, she celebrated a Breeders' Cup victory with Dayatthespa as well as a handful of other Grade 1 winners. Her experience and consistent attendance at the races led her to Bradley Weisbord, who unlike her was born into the racing world and therefore had an extensive network of contacts that Crow did not. In 2015, she joined him at BSW Bloodstock. Most of her time is spent doing just that – watching the horses. While Crow (gratefully) does not have to be up at 3:00 a.m. most mornings, she loves going to watch the breezes and attending the races every afternoon. Now that the circuit has moved to Florida, New Orleans and Oaklawn, she'll be traveling to those locations instead of driving just up the road from her Lexington, Ky. home to either Keeneland or Churchill Downs. It's a little bit tough, she admits, because her husband is a hands-on horseman in Lexington who can't travel with her very often, and Crow rarely has time to enjoy the fox hunting horse she owns with her mother. Still, she wouldn't trade it. This entry was posted in Connections, NL Article, People and tagged brad cox, Breeders' Cup presents Connections, Chelsea Hackbarth, Connections, leofric, liz crow, monomoy girl by Chelsea Hackbarth. Bookmark the permalink.